It is an exciting time On the Hill! Our winter sports are in full swing and several of our spring sports are just about ready to kick off their seasons. As always, this is a great time to be an Arkansas Razorback! Our softball team opens its season this weekend with a tournament in Lake Charles, Louisiana. Last season, Coach Courtney Deifel and her team made school history, hosting the first NCAA Regional in school history and advancing to the NCAA Super Regional round for the first time. I am excited to see what this season has in store and hope you will plan on joining us at Bogle Park later this month when we open our home schedule. Free admission at Bogle Park for fans of all ages. Now that is a deal! A week from today, Friday, February 15, the OmaHogs return to the diamond to start the 2019 season. We all still remember the magical run to the College World Series finals last season and Coach Dave Van Horn has another talented team ready to take the field this season. I want to personally thank our fans for their tremendous response to our baseball program. Before we throw the first pitch this season, we have sold out with a record number of season tickets (6,300+). Don’t have your baseball tickets yet? Don’t worry there is still an opportunity to explore a variety of ticket options online. We look forward to seeing you at the ballpark soon! When Razorback baseball fans head to watch our team open the season against Eastern Illinois, they will be going to a familiar place – with a new name. In recognition of the extraordinary longtime support of the Walker Family and the Willard and Pat Walker Charitable Foundation, the nation’s top collegiate baseball ballpark has been renamed Baum-Walker Stadium at George Cole Field. The Willard and Pat Walker Family have been instrumental in supporting Razorback Baseball for many years, including a signature gift to help enable the original construction of a new baseball stadium in 1996 as well as a recent commitment to support a new baseball clubhouse facility that will be constructed down the right field line. Speaking of Coach Van Horn, I know the Razorback Family joins me in congratulating Dave on his recent induction into the Arkansas Sports Hall of Fame. Dave was honored at a banquet in Fayetteville last month in a special ceremony, that featured many memorable stories about Razorback Baseball present and past. This is the first time the Arkansas Sports Hall of Fame has held a banquet to honor an individual inductee. I can’t think of a more deserving recipient. Be sure to check out this tribute video. Currently, eight Razorback sports are ranked in their respective national polls. Women’s indoor track and field leads the way as the No. 1 team in the nation as we enter this weekend’s Tyson Invitational at the Randal Tyson Track Center. Men’s track and field also carries a top 10 ranking into the weekend, coming in at No. 22 this week. We are only two weeks away from the SEC Indoor Track and Field Championships (February 22-24) right here on the campus of the University of Arkansas. Women’s and men’s golf continue to make waves nationally. The women’s golf team is ranked No. 6 with the men’s golf team coming in at No. 13 this week. Both teams will be competing to qualify for the 2019 NCAA Men’s and Women’s Division I Golf Championships (May 16-19) at the Blessings Golf Club, here in Northwest Arkansas. Softball makes its debut in the pre-season poll with its highest ranking ever. The Razorbacks are ranked as high as 12th entering the 2019 season. Similarly, baseball is earning mention in the pre-season college baseball polls ranking as high as 13th to begin the year. Gymnastics continues to rank among the nation’s best coming in this week at No. 24 in advance of tonight’s dual meet with Alabama. And a shout out to the No. 26 women’s swimming and diving team who finished up its home schedule last weekend with a meet win over the Kansas Jayhawks. I want to encourage Razorback fans to join us for our celebration of the 1994 National Championship Men’s Basketball team on Saturday, March 2 at Bud Walton Arena. It has been 25 years since Scotty Thurman drained a three-pointer to bury Duke and help Coach Nolan Richardson and the Razorbacks to the NCAA title. Plan on joining us at Bud Walton Arena as we welcome back the team and celebrate the 25th anniversary of this magical moment in Razorback history. It is also a great time to catch the current Razorback men’s basketball team who is on a roll in SEC play. Coach Mike Anderson’s team has won four straight SEC games, including a road win at previously undefeated conference foe LSU. There are four Saturday home games remaining, so come cheer on the Hogs at the Basketball Palace of Mid-America. Coach Mike Neighbors and our women’s basketball team has also been making a name for themselves. Last month, our women’s basketball team won for only the second time at Tennessee. They are an exciting team to watch and there are still a few more opportunities to catch our women’s team in action, starting with this Sunday’s game against Auburn. Congratulations to Coach Chad Morris and the football staff on completing an outstanding signing class. 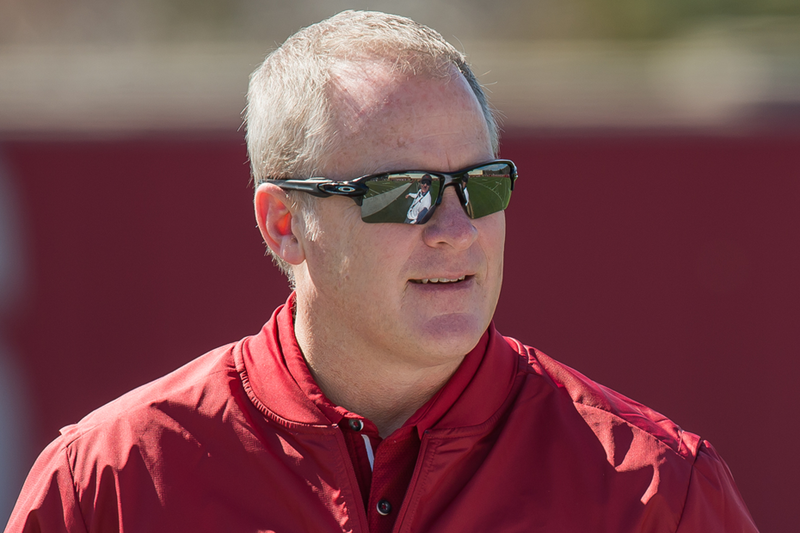 Our football program signed four new Razorbacks earlier this week to finish off one of the highest ranked recruiting classes in program history. The class has been ranked among the top 25 recruiting classes in the nation and is helping position us for future success to come. One of the great things about the University of Arkansas, is the way the love for the Razorbacks is passed from generation to generation. Through the years there have been many families who have had multiple generations take the football field for the Razorbacks – the Joneses, the Hortons, the Bequettes and so many others. Hudson Henry is a part of a Razorback legacy family as well and I invite you to read in his own words, what signing with the Razorbacks means to him. The 2019 Annual Fund Campaign marks the 40th-anniversary of The Razorback Foundation, Inc. In the early 1970s, legendary football coach Frank Broyles, coach Wilson Matthews, athletic director George Cole and a small group of business leaders formed the Razorback Scholarship Fund in an effort to create an innovative way for fans to support the athletic program while receiving benefits and recognition. Those efforts continue to be vital to our success today through the Razorback Foundation. To all of you who are Razorback Foundation members, please know you are playing an integral role in the lives of our student-athletes. Looking to be a part of our team for the 2019 NCAA Men’s and Women’s Golf Championships at Blessings Golf Club this May? There are many opportunities to get involved. To find out more visit the official championship website. Congratulations to five former Razorback football players who advanced with their teams to Super Bowl LIII. Brandon Allen was a member of the Los Angeles Rams while four former Razorback players earned Super Bowl rings with the New England Patriots – Trey Flowers, Deatrich Wise Jr., Cody Hollister and Dan Skipper. Former men’s golfer Alvaro Ortiz recently won the Latin America Amateur Championship. As the champion, he earned an automatic berth into the 2019 Masters at Augusta National Golf Club. Congratulations Alvaro! Kudos to current women’s track and field assistant coach Bryan Compton who was recently recognized nationally. Coach Compton was named as the National Collegiate Coach of the Year at the National Pole Vault Summit in Reno, Nevada. Coach Compton has turned the University of Arkansas into Pole Vault U for women’s track and field.